The experimental 6DoF controllers and faceplate should arrive already paired. You can use the steps below to verify pairing or repair the devices if needed. Turn off both 6DoF controllers using the power switch located on the bottom of the controllers. Physically attach the faceplate onto the front of the Mirage Solo, using the straps on the faceplate to secure it in place. Using the provided USB-C cable, connect the 6DoF faceplate to the Mirage Solo. Power on both 6DoF controllers. If the faceplate and controllers aren't paired, follow the steps below to pair them. You need to do this for each controller, one at a time. Pairing doesn't require controllers to be turned on and off. Hold the faceplate's pairing button for one second to put it into pairing mode. 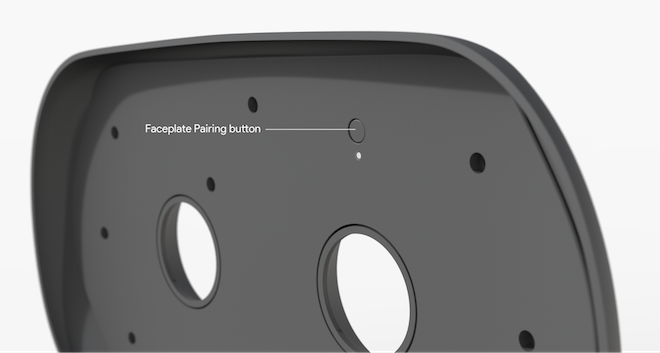 While holding the faceplate’s pairing button, hold down both the App and Daydream buttons on the 6DoF controller. When the devices are paired, release the buttons. The LEDs on the faceplate and controller should display solid white. Repeat steps 1-3 to pair the faceplate with the second controller. Warning: After a controller is paired with the faceplate, holding the App and Daydream buttons together cause them to unpair. Turn off any already paired controller. Power cycle the faceplate and controller. Repeat steps 1 through 4 in the above pairing procedure.